Our site represents different ways of shuffling cards. 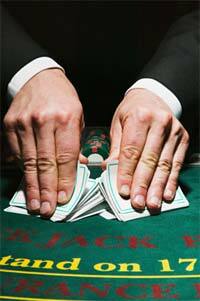 It is very important to get familiar at least with some of them if you are a card player. Otherwise, you might get into uncomfortable situation. So choose several methods which are appropriate for you and apply them in your game. One of the widespread ways to randomize a deck is the pile shuffle. It is actually not so effective as pile shuffle (especially combined with the riffle shuffle) and is used mostly by beginners to play a card game. Let's get into strip cutting. This looks a little bit like shuffling but it`s done in smaller packets of cards and using a cutting process to randomize. Strip cutting exists along with the straight cutting. In order to do a strip cut you have a deck in front of you. Take your middle finger and your thumb grabbing the outer edge of the deck, lift up the deck away from the table. Check carefully, you should be able to hold the deck by these two fingers. Now you need to come over with your left hand and by tacking your index finger and your thumb try to strip the top packet straight off the deck to your left hand. The bigger part of the deck is in your right hand and with the packet that you`ve just stripped off the top on your left. Then drop the cards on the table. After this come back over to the packet and repeat the procedure: strip away the top half - drop it on top, strip away the top half - drop it on top. Come over with the last portion, drop it on top. You should perform this technique not so fast as weave shuffle review, but still the certain rhythm should be present. It is important to learn this technique step by step and at the beginning perform it slowly. With the lapse of time you can speed up the process, and then your technique will look perfect and fast. Sometimes you might be annoyed by the cards which leap out of the deck during the process. Just square them up quickly and proceed what you are doing. Remember, the most important thing about this shuffle is to clip the cards by the index finger properly.